Here's the hole the last piece of my jigsaw fitted into. I decided to go and visit it. But, given it was entirely blank, where precisely was it located? I decided it must lie between Dagenham Heathway and Elm Park reading across, and between Upton Park and West Ham reading down. These limits provide the four edges of a rectangle in real life, so that's where I've been today, just north of the A13 spanning Barking & Dagenham and Havering. Intriguingly the rectangle is over two miles long but only half a mile deep, because the tube map really does squash reality something rotten. To help get your bearings, think Ford of Dagenham. Their enormous car plant was the dominant feature hereabouts for 70 years until it mostly closed in 2002 and almost completely folded in 2013. 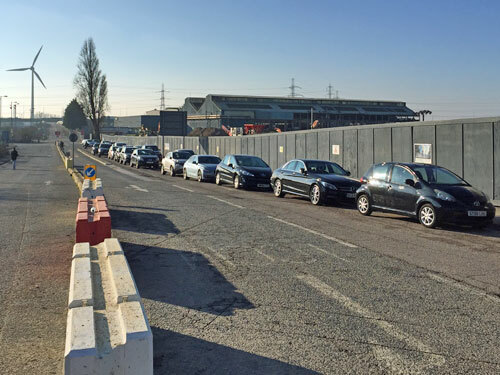 Its disused buildings are currently being levelled, courtesy of Scudder Demolition, whose operatives can be seen grinning in front of photos of what they've been knocking down, pasted along the perimeter hoardings. Interspersed with these are schoolchildren's artworks and (I kid you not) several photos of an employee's Lego model of the demolition works. The former cinema building facing the car plant's main entrance has evolved into an Afro-Caribbean church, as has the former bank on the corner opposite. On Sundays both are frequented by flocks of the immaculately behatted (and on Wednesdays and Saturdays by visitors to the Dagenham Food Bank, because loss of employment has consequences). Across the road, behind the McDonalds drivethru, lies the Rylands Estate. This whorl of Thirties housing is enclosed by Oval Roads North & South, and densely packed with curving avenues of not-quite semis (because they're joined in fives, sixes and sevens). Once upon a time all of these would have been pebbledashed, but Right To Buy means several are now painted, plastered or embedded with some approximation of crazy paving across their frontage. 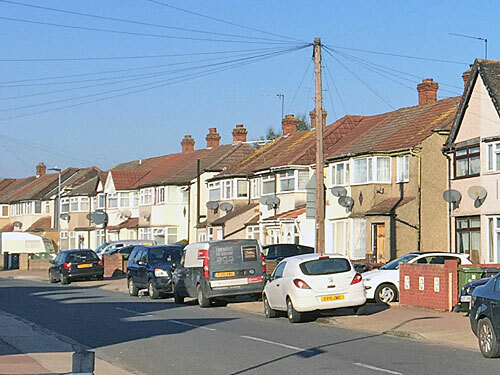 A typical house features a satellite dish, three bins and at least one parked car, maybe a van, possibly a taxi. Some of the residents are still elderly ex-Eastenders, but walking the streets confirms that the incoming demographic is considerably more pan-European/inter-continental. The local primary school has decided to offer free 'Breakfast Bagels' at the gate every morning to improve attendance, or fend off hunger, or both. 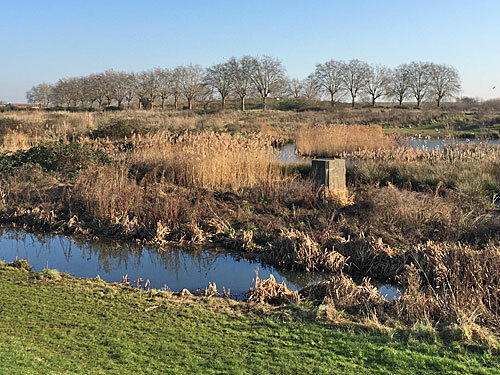 Behind the community centre and boxing club lies Beam Valley Country Park, a large expanse of remediated wasteland and former gravel pits where two rivers meet. One is the Beam River, the other the Wantz Stream, and between them an attractive reedy wetland area surrounded by raised embankments. Here the local populace walk their small children or their hounds, encouraging the former to feed the waterfowl and cleaning up as necessary after the latter. Come sit on a backless bench, or scan a vanished information board, or stroll briefly along a long-derelict section of the Old Romford Canal. Across the river, in Havering rather than B&D, the Orchard Village estate stands out like a sore thumb. Its modern apartment blocks were built to replace a 60s cluster of highrises and maisonettes, but have proved notorious for poor construction, inadequate insulation, undrainable gardens and sewage backflow. 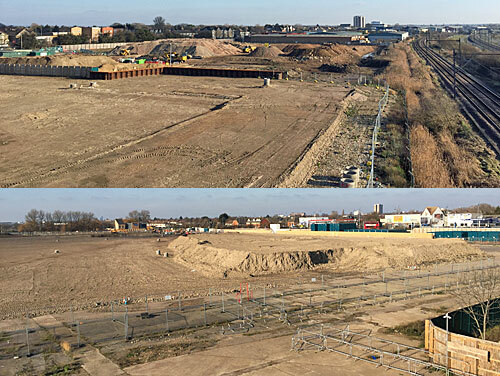 Living next to a landfill site hasn't helped either, but a fourth stage of construction is underway undeterred, including denser flats and a rather tasteful curving terrace of brick townhouses. Alas a single Costcutter does not a community make, and you'd still think twice about living here. Continuing east we hit South Hornchurch, a suburb three miles distant from its namesake, where the bungalow count increases considerably. Think twitching net curtains, bulked-up sons washing their cars, the occasional St George's flag, and hey presto we've reached Rainham. Where 20th century suburbia ends, facing off across New Road, a mile-long stripe of derelict brownfield is destined to rise again as Beam Park. 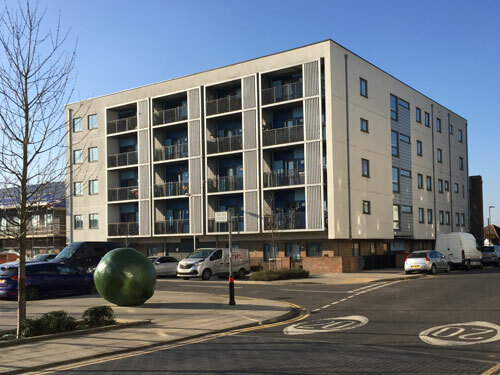 This long-promised, half-affordable housing development was recently kickstarted by the Mayor after Havering councillors kicked up a fuss about the height of its towers. If you believe the hoardings the first of its 3000 homes will be opening in Early 2019, but the sole completion thus far is the showhome, a surprisingly narrow modern townhouse attached to a sales office nobody's quite got round to opening yet. The remainder of the site consists of hundreds of acres of flattened earth, occasionally piled up into terraces intended to raise ground floor apartments above flood level, but mostly still entirely featureless. 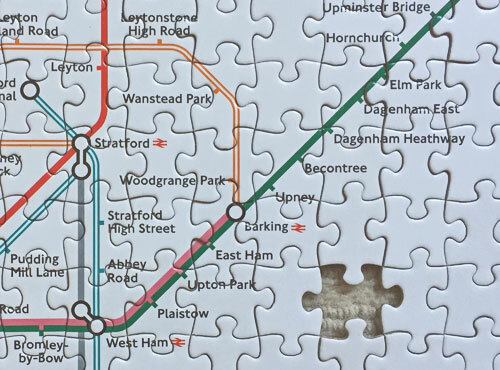 One day its hoped that trains will stop on its easternmost flank, but don't expect to see Beam Park station on the tube map because it's on the wrong line, ensuring that this particular jigsaw piece remains entirely blank.